When reviewing vendors, you need to consider more than just the bid. If possible, schedule a team visit to the factory or company headquarters. Think about how you would feel working in that environment. Also, visit customers who are using the equipment or service. Talk directly to the operators and programmers without any sales staff around. Bidders should be required to submit references from companies that are similar in size to your company, and are using similar, if not the same, equipment or service. Call references and schedule a time to discuss the product and vendor. After the call, send a thank-you email. • What specific product or service do they use? • How long have they used the product or service? • What are their general feelings about the product or service? • What are the operator requirements? • How is the repair service response time? • Have they used a competitor's product or service? Which ones? • Why didn’t they choose another vendor? • What would they have done differently in the bidding or contract process? • Is a site visit possible? • Thank you for your time! An effective way of comparing bids is to use a scoring chart. A scoring chart provides a practical method of measuring how closely a vendor's bid matches your goals. The chart consists of four columns – Topic, Weight Factor, Raw Score and Weighted Score. A shortened version of a chart to score inserter bids is provided below. The first column, Topic, lists those areas and characteristics that you want to use to compare the bids. Weight Factor, the next column, adds a numeric value to represent how important that characteristic is. This chart uses a scale of 1 (low) to 5 (high). The Weight Factor should be established when drafting the RFP. For example, machine speed is somewhat important (3), and machine accuracy is very important (5). The vendor's Raw Score is then determined by how well they meet that need. Here, use a broader scale of 1 (low) to 10 (high). 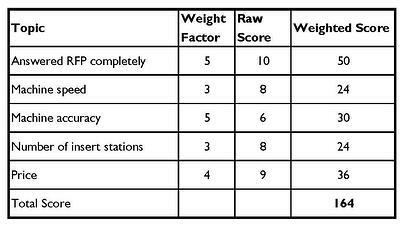 The Weighted Score is derived by multiplying the Raw Score by the Weight Factor. When the responses are received, distribute blank scoring sheets to the RFP team. Each member should fill out the responses individually to prevent coercion (implied or otherwise) from the senior members of the team. Use an electronic spreadsheet to collect the information and calculate the average scores for each vendor. The RFP team then meets to review the individual and average scores. Discuss any significant variances between scores. For example, one person may score the machine accuracy a "10" and someone else graded it at "4". This point needs to be discussed, opinions considered, and if appropriate, scores adjusted. Like price, the score shouldn't be the sole factor in selecting a vendor. Ask legal and procurement to conduct a comparison of the financial status of the top bidders. Review any feedback you received from references, both positive and negative. Request follow-up presentations from the vendors so the RFP team can ask more detailed questions. After the team has made a decision, notify the selected vendor, and all the competitors. Call each vendor, and briefly explain the rationale for the team's decision. Send an email, or letter, thanking all vendors for participating in the RFP process. You don't need to defend your decision to a vendor, but remember you may be doing business with these vendors on another project. You've awarded the bid, but you're not done. The contracts will need a final review by legal and procurement. Make sure to include testing and delivery dates in the purchase contract, with financial penalties if a vendor fails to meet those dates. For service contracts, include a detailed service level agreement (SLA). The SLA will define mutually accepted measurements and standards. If appropriate, include a section on operator training. Specify the factory and site acceptance standards that must be met before payment is issued. Monitor the receiving and acceptance process very closely. Require the vendor to provide proper notification of delivery and installation. This is critical for equipment and software to ensure that the space is prepared or access to systems is available. 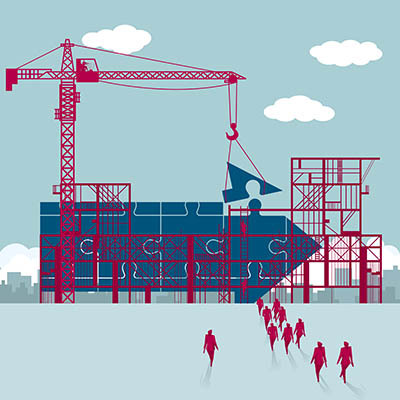 Don't allow the vendor to leave your site until the installation is completed in accordance with the contract. Meet with the operators to ensure that they're properly trained. Sign the acceptance letter after you've verified that the product is performing to the established standards. When the project is complete, conduct an after-action review. Have the team members formally evaluate the process and the final decision. Encourage an honest and frank discussion on how things could've been improved. Meet with the vendors and get their feedback as well. Share the final report with all members of the RFP team. You may want to consider becoming a site-reference for your vendor. If the process went well, the vendor will want to share your story with other prospects. Also, since they know that prospects will be calling you and visiting your site, you can be sure the vendor will pay special attention to your account. Plus, you expand your professional network each time you answer a reference request. At times, the RFP process may seem long and tedious. By creating an RFP team and following this process, you'll increase your chances of success when purchasing equipment, software and services. Take your time and build an RFP that works.